Since completing his studies, the visionary violinist has committed himself to a clearly defined goal – introducing young people to the classics and kindling enthusiasm for so-called ‘serious’ music. Combining classical elements with those of pop and rock as well as rhythm and blues is a means to this end and with this, he is following in the steps of his heroes, for the great virtuosi from Paganini to Heifetz did exactly the same with their styles then. Whereas many conservative contemporaries wonder whether uncompromising excellence and popularity, art and commerce can or may even be reconciled, David Garrett long ago proved that it is possible, enthralling listeners of all ages. The same new, incredibly electrifying spirit pervades lofty philharmonic halls holding sold-out classical concerts and open-air arenas staging crossover programmes. People sense that they are being taken seriously, that a person is performing who approaches the task with the utmost discipline while creating an awareness of various musical genres and styles. Garrett’s desire to diminish the awe of classical music felt by young audiences in particular, to spark a whirlwind in the music scene while striving to sweep as many people off their feet as he possibly can, is fulfilled to an overwhelming degree. Only this mixture of perfectionism and openness, thoroughgoingness and foresight explain the overwhelming success which David Garrett has had since the release of Virtuoso. With this recording the artist presented the public with his vision of how various musical styles can be creatively fused at a high artistic level without compromising musical standards. The succession of his own compositions, interspersed with arrangements of classical pieces ranging from the virtuoso “Paganini Rhapsody,” based on Caprice No. 24 by Niccolò Paganini, to the emotionally intense rock classic “Nothing Else Matters” by “Metallica”, have stunned the music world. Advocates and critics sparked off a dialogue about musical orientations which has rekindled and refocused interest in how music communicates itself. The artist was rewarded with an ECHO Classic 2008 in the category “Classic without Borders.” “Encore” followed fast on this first success in October 2008, even surpassing the previous release as a follow-up album. 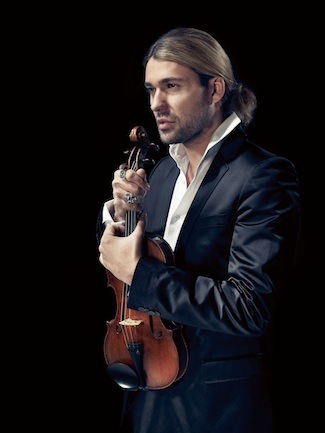 In the USA, “David Garrett” remained at number one in the classical and classical crossover charts for months. Apart from the successful Rock Symphonies Tour, 2011 was entirely devoted to classical music for David Garrett. Invitations took him to renowned festivals at Verbier, the “Kissinger Sommer” and the Enescu Festival Bucharest, the Concertgebouw Amsterdam and to perform with orchestras including the Vienna Symphony Orchestra, the Russian National Philharmonic Orchestra and the Museumsorchester Frankfurt. In the autumn, the star violinist was also an honorary jury member at the International Music Competition Cologne, which is hosted by the Hochschule für Musik und Tanz Köln. With his new album “Legacy”, released at the beginning of November 2011 on the DECCA label, the artist fulfilled a lifelong dream. As well as Beethoven’s Violin Concerto, which David Garrett describes as the “king of the violin literature”, the CD includes selected works by Fritz Kreisler. Kreisler was not only a celebrated violinist, but also a gifted composer. He wrote two beautiful solo cadenzas for Beethoven’s concerto: a longer one for the first movement and a somewhat shorter one for the third movement. David Garrett regards Fritz Kreisler as a hero, and so, for him, it was natural that he should also perform these two cadenzas. “Legacy” has enjoyed extraordinary success: on its release, the album entered the Media Control Charts directly at number 6, making it the highest chart entry of a classical instrumental album in German music history. In the classical charts, “Legacy” immediately took the number 1 slot in both England and Germany. 2012 also began creatively and highly successfully for David Garrett: in January, Universal released the DVD “David Garrett: Legacy – Live in Baden-Baden”, and “Legacy” achieved gold status as a purely classical album. A tour of the United States followed in February, and in March David Garrett was in south-east Asia. From April the violinist will open a new chapter in the realm of crossover: the Rock Anthems Tour promises new arrangements, songs and sounds. With the Sinfonieorchester Basel and Dennis Russell Davies he will perform the Beethoven Violin Concerto. His recital tour takes him to the Philharmonic Halls of Berlin, Munich, and Cologne, as well as the Alte Oper Frankfurt, Leipzig Gewandhaus and the Teatro Massimo Bellini, Catania. In May 2012, David Garrett makes his debut with the Orchestra Sinfonica di Milano Giuseppe Verdi and John Axelrod.